To be published by Fotohof edition, Salzburg, 176pp., case-bound with dust-jacket. Circulation is a collection of eighty-five silver gelatin, black and white photographs made over a decade, 2001-2011. As in Overseas, his first monograph published with Fotohof edition in 2004, Palmer has continued to address complex questions about problems of representation and misinterpretation of landscape with its inscribed cultural codes of progress and change. His pictures are not about describing the world, but are “much more about bringing together different fragments of the world into one location, and that location is the photographic picture plane” (Palmer). In this new book the photographs are carefully sequenced and are presented in three groups. ‘Circulation’,comprises forty-four photographs made on journeys in Europe, Africa, north, south and central America, the Caribbean and Asia. 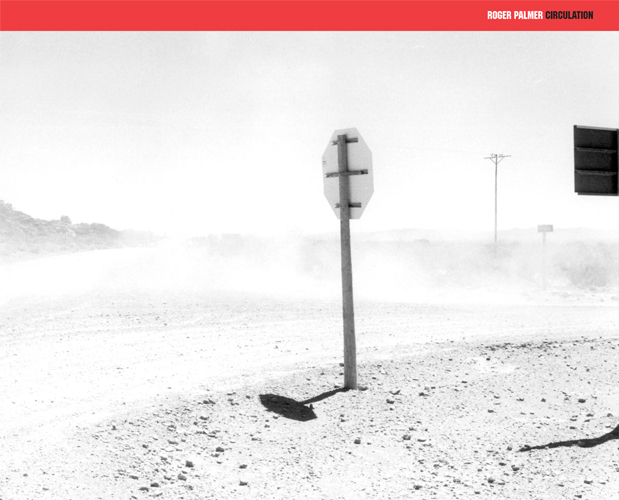 ‘Latitude’ presents eighteen photographs made on journeys to the Tropic of Capricorn in Australia, Namibia, and Brazil in 2008 and 2009. ‘Meridian’ presents eleven pairs of photographs made in South Africa and the northern regions of Finland, Norway and Sweden in 2010. The book also includes a conversation between the artist and Lisa le Feuvre, Head of Sculpture Studies at the Henry Moore Institute, Leeds, and an essay by Penelope Curtis, Director of Tate Britain, London, in which she recalls her experiences as Palmer’s travelling companion on a recent journey through South Africa.